In March 2008 my life changed forever. I was sitting on my sofa watching TV and out of nowhere, I had a panic attack. At the time I didn’t know what was happening to me, I quickly called my husband and asked him to come home as I thought I was dying. I was so frightened, from that day on anxiety took up my whole life, I was at the doctors every day, I would go to my local A&E 3 times a week as I was so convinced there was something seriously wrong with me and that the doctors were missing it. Things got bad quickly, I couldn’t take my son to school, I couldn’t go to work, and then I couldn’t even leave the house. I was so afraid to be on my own so I went to stay with my parents. Whilst I was at my parents (14 weeks in total) I went to see a doctor in the area, she was sure I was suffering from anxiety. I’d never heard of it, she explained and said “I’m going to put you on some medication to help you” at the time I just thought this was what you had to take to CURE anxiety. I was so thankful and thought as soon as I start taking these tablets it will all go away….how wrong was I. After the first tablet I felt even worse, and as the week went on things just went from bad to worse. I called the doctor and she said it was normal to feel worse initially and things would settle. During my stay at my parents, I was reading up on anxiety, buying books on it, trying programs, anything I could to feel better but with no joy. Eventually, I did start to feel better but looking back it’s probably because I pushed myself once I felt able to. The next 2 years I was able to work, look after my children and enjoy life again, even move house, go on holiday abroad and have a baby!! This was short lived and I had a panic attack at work….I had been taking paracetamol for tooth pain which I was unaware contained caffeine! After 36 hours of that my anxiety was full blown and I didn’t know what to do…once again I went to the doctor and he said: “you need to go back on your medication”. I said ok but knew I would be in for a rough ride with the initial side effects again. Once again I went to stay with my parents until things settled. It was 9 weeks of hell again but once again with more CBT I managed to get through and start doing things again. Fast forward to May 2016…. I was sat in a lecture theater full of people and all of a sudden I had a panic attack…here we go again I thought…long story short I had to take a year off from my studies. I coped well with the anxiety given how I felt and thought I just needed time out as I was doing too much and under a lot of stress. From that day on my anxiety was higher than it was in May and I was struggling to cope, things got worse and once again I ended up at my parents’ house for 7 weeks. Most days feeling sorry for myself and not knowing what to do, I couldn’t cook, clean, sleep, work or even function remotely. I was constantly crying, constantly scared and feared I would never ever beat this as I was already on meds so why did I feel this way. I wish I knew then what I know now as I would never have taken that first tablet back in 2008. I was having depersonalisation, burning skin, couldn’t eat and lost 3 stone, irritability, headaches, reflux, nervous tummy, panic attacks, inner vibrations, irrational thoughts, what ifs. You name it I had it, 24 hours a day 7 days a week. My doctor convinced me to change medication as this was probably not working anymore. Worst decision of my life, if I thought I was already feeling awful then I was about to be thrown into a world of hell that would be my worst fear imaginable. After stopping this awful new medication I was opening up to a friend who searched the net and found DARE… she ordered it for me and had it delivered to my parents’ house. I was dubious at first as I had read so many books, read so many stories that claimed to work but with no success. In the end, I thought it was worth a try, anything was better than feeling the way I did and I wanted so much to get better, not just for myself but for my children too. 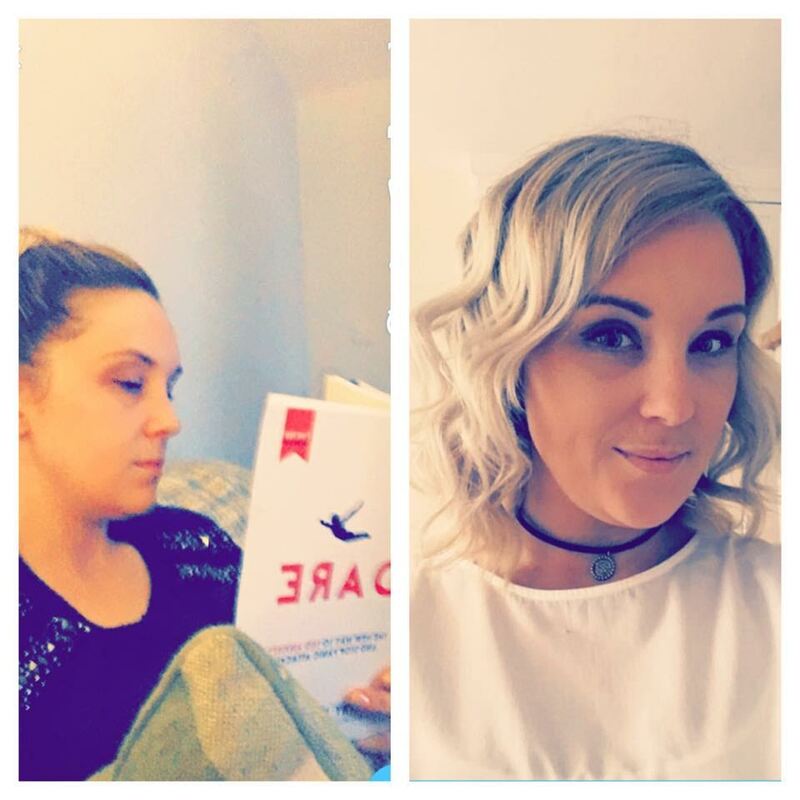 After reading the book I felt quite positive but I knew I’d felt this way before from reading anxiety books…the only thing that disappointed me was it was NOT a quick fix like I hoped and I thought surely it’s not that easy? I started applying the steps straight away, after a week I was still feeling the same and felt deflated. I then reread the book again and found things I’d missed the first time, I highlighted paragraphs and statements I found helpful so that it was easy to go back to if I needed to. When I felt anxious I would say “so what, I’ve felt like this before” this took a lot of practice but found that the diffuse was the easiest step for me. I was going to feel this way anyway if I didn’t try, this slowly became a mantra and as soon as I felt any anxiety I would use that statement. It also helped to write down how I was feeling so I could look back and see that I actually had felt this way before. Then came ACCEPT AND ALLOW, this was a hard step for me and still is the hardest step of all 4. To accept the way you feel is hard to do when you feel so dreadful…why would I want to accept this?? Well….because what is the alternative? for me, it helped to name my anxiety and I named her Maureen, I would talk to her as if she were a person and sometimes felt sorry for her (strange I know) and I never thought I’d feel that way. The ACCEPT AND ALLOW for me I feel is a big part of the step, in fact, the most important to me, because if I don’t allow it and accept it I can’t do the next 2 steps. I’ll tell Maureen “ok Maureen, I know you want to keep me safe but I’m in no real danger right now, I have a few things to do and your welcome to come along with me but I won’t be paying you much attention as I have other things to do”. This takes practice and a lot of the time it was easy to give in to her but I kept picking myself back up each and every time. The RUN TOWARD step is not something I do every time I implement dare, everyone is different but I don’t feel the need to do this step constantly. the ENGAGE step has recently been getting easier and I have noticed that the more I practice the engage Maureen sometimes doesn’t show up at all, she can stay away for 5-6 days at a time and only show up for a few minutes a day meaning I don’t need to implement any steps at all. Again all this is due to hard work and practice. My first achievement was to take my daughter to school every morning, that was it to start with, the first few days were hard but the more I did it the easier it became, then it became normal. Then after 2 weeks, I would add something else, next it was to cook the tea, nothing fancy like I used to do but something healthy and got me off the couch!! This again became easier and the more I did it (no matter how I felt). Then I’d add more, like cleaning 1 room or popping to the supermarket. The more I did the more tired I became but I kept pushing and always listened to the deep release audio as I knew it would be easy to slip back into old habits. I’m not saying every day is easy as it’s not…BUT I am now able to stay on my own (even overnight on occasion). I am cooking, taking my daughter to school, cleaning and even now starting to ease myself back into my job. I didn’t wake up one morning cured, it took hard work, support, and dedication. I’m certainly not fully recovered as I am still scared at times, but it’s not the anxiety I’m scared of…it’s the fear of going back to giving into it and ending up alone, but I know that with my new knowledge and tools, I can get through this. I cannot thank Barry enough for writing this book and the support himself and his team give me through my continued DARE journey. I know I would not be where I am today without this. I am still on my DARE journey with a few setbacks along the way BUT…Barry has not only given me the tools I need to conquer Maureen but also the confidence to believe in myself which is something I didn’t have before! So, so happy for you! I think my biggest challenge is the accept and allow step as well. I’m still absolutely convinced that if I do, the ONE is going to hit and that’ll be the end of me. But, I’m having success with the first step so I have some hope. Congratulations again and I loved reading your story-keep DARING! Thanks for sharing your story. I have had similar things happening. Thank you for sharing your story Claire. I can relate to the fear of of giving back into it. It’s really hard to stay strong and not give in some days. Dare takes a lot of strength and work, but I believe it does work. This is amazing thank you so much. Thanks for sharing your story. Very inspiring. And its very similar to mine. Face the fear and egg on the panic. It works just about every time. Trust me I have had my share of days that I want to just go back to the couch and cry, but I be seen a side of life and I love it! 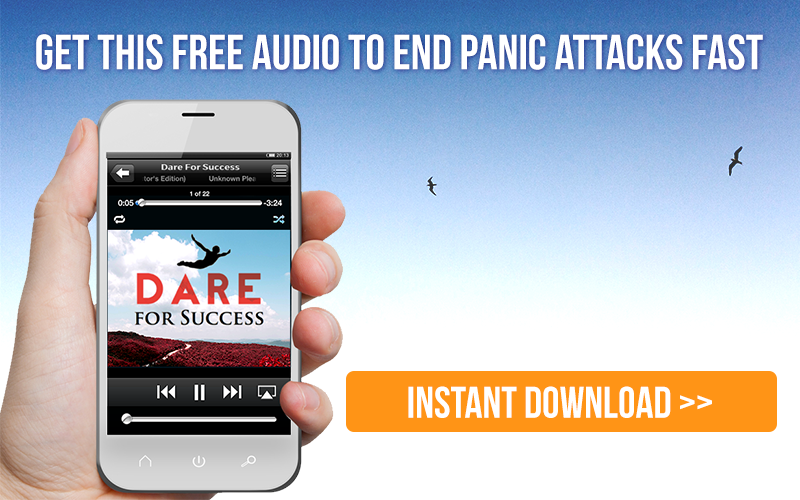 Anxiety and panic will never steal minutes from me again! You’re on the right path, don’t change lanes. Thanks for the story, it really helps me! Claire…what a great testimony! I think step 2 is the most difficult, as well…but when I hear about others having to work hard and keep pushing, I know that I can do it, too! It is great to have a support system….thank you for your enlightening story. Thanks for sharing. My panic is only associated with high speed highway driving. I’m so glad Dare gives you a prescription for practice (1/hr/week) to stick to; I’m about 7-8 weeks in and the sickening physical symptoms lessened each and every session and are non existent. It’s become a silent conversation with myself. When I’m done, the whole rest of my day and life is better. The first time I had it I didnt know what hit me either. I couldnt go out, i was scared, all the sensations I felt were horrible (and there are so many of them 😐) but I got there, refused medication, went to the health store, I ut out caffeine, and drink chamomile tea. Then it came back when a series of events happened, big time. But this time I refused to stay in like last time, and carried on. I love the name youve given yours, so have decided to call mine Bert. Dont ask me why lol. Yes Its debilitating, it wears you out, but Im a stronger person now, and I also do meditation which helps a lot. Good luck and thank you for sharing Claire. How awful that you had no idea what had happened when you had your first panic attack. So much has been know about them for decades and yet doctors will just look at us oddly and they panic if you do so in the surgery. The constant not knowing for so long caused a trauma in itself and that adds to the problem. Doctors will only send you to CBT and as you say give you anti depressants. They just make you feel s so ill and when you tell them they just insist that you still continue with the tablets. It has more to do with the companies who make the tablets and pocket the money than that they might work. Valium has been proven to be the most useful tablet if one has to take something bring anxiety levels down. Not the answer perhaps but they do make you feel normal enough to make focused decisions and feel better and have some control. It is great that you had parents to support you and brave enough to go to them for many have neither parents or support and still some of us over 50 years are still trying to help ourselves and not succeeding so well done.